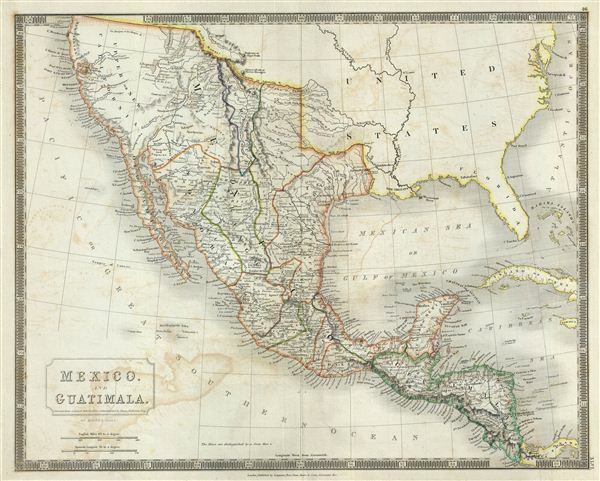 This is a beautiful map of Mexico and Guatemala from Sidney Hall's extremely scarce 1835 New General Atlas. It covers from Upper California and New Albion south to Guatemala, including the modern day regions of California, New Mexico, Arizona, Colorado, Utah, Nevada, Texas, Guatemala, Honduras, Nicaragua, El Salvador and Mexico. Hall's map offers an interesting pre-Republic mapping of Texas folded into the Intendancy of San Louis Potosi. Hall also maps the apocryphal Buenaventura River running from the Rocky Mountains westward through 'Salt Lake' and westward to San Francisco Bay. The Buenaventura is the last incarnation of the apocryphal River of the West, a long sought after speculative alternative to the Northwest Passage. The mapping of Buenaventura here again references legitimate discoveries by Escalante of the White River and the Sevier River. In this case, both are mistakenly associated with the River of the West and given an erroneous outlet into San Francisco Bay. Towns, rivers, mountains, railroads, canals, marshes, forests, and various other important topographical details are noted. Elevation throughout is rendered by hachure and political and territorial boundaries are outlined in color. In addition to geographical notations, Hall also identifies a number of American Indian nations including the Moqui, Apache, Juma, Nochi, Poagos and Yahipias (with long beards). Several mines are also noted throughout. Very good. Original platemark visible. Minor wear and verso repair near original centerfold. Some offsetting. Rumsey 4224.047 (1830 edition). Philips (Atlases) 758.